So you have a business. You’re selling a product, a service, or maybe a combination of both. Regardless, you have customers and with customers come complaints. Even the most efficient business owner with the perfect product will run into complaints at some point. Things happen. Mistakes are made, and customers will let you know about it. In today’s social media-driven world, it is easier than ever for your customers to let you know about an issue and they can do so almost instantly. Some people may see this as a negative because customers can publicly display your mistakes and scare off potential customers, but I’m a ‘glass-half-full’ kind of guy. I see this as a positive because you can now know about that mistake immediately and you’ll have the opportunity to solve that problem quickly. When handled correctly, solving an issue can actually create a stronger bond between you and your customers. If they know you’re willing to admit to a mistake and also willing to fix that mistake, they’ll be able to shop with the piece of mind that they will (one way or another) be satisfied with their experience. Here’s where a lot of small businesses run into trouble: Social media has created a instant gratification need in your customers, so when they voice a complaint on one of the many available platforms, you better believe they want a response instantly. a.) How your team needs to respond publicly to a complaint. What should and should not be said or promised publicly. b.) What should then be communicated privately to the customer. c.) How you plan to solve your top 5 most common issues and who needs to step in when the issue is uncommon. d.) An escalation strategy for when your initial attempt does not satisfy and/or when a customer begins or continues to insult your brand publicly even after the acknowledgement of their complaint. e.) How you will track the complaint, the steps taken to remedy the issue, and the end result of the engagement with each customer. f.) How and when your team should follow up with customers who have publicly voiced complaints. g.) How you will regain the business of affected customers. I say this a lot, but its called SOCIAL media for a reason – people want to be social. They want to interact with you and know you care. Don’t be afraid to apologize on social media. Even a customer who has never had an issue with your products or services will take comfort in the fact that you take responsibility for mistakes and work to make things right. They’re all going to see the complaint, so you need to make sure they all see you making it right. Apologizing publicly is a good thing. Offering a free meal or replacement part publicly isn’t necessarily as good. It can be dangerous. Some people may see it and think, “oh man, if I just complain on Twitter, I can get a free meal.” This can spiral out of control, so contact the affected customer privately. Apologize again and find out every detail you can about the issue. This one should maybe go above #3. When you contact them privately it gives you an opportunity to find out more about what caused the complaint, but you may want to make things right first. Solve their issue and then find out as much detail as you can. When you ask all the questions before offering the solution your customers may feel like you’re trying to weasel your way out of the situation; hoping that one of your questions will stir up some sort of loophole where you can flip the issue around and shrug off the blame. I know. I know. That’s not how you do things. You’re going to make it better. But most people have had crappy experiences in the past and typically they were asked questions first and had their problems solved after. I’ve found that if you take care of them first and make things right, they’re more likely to give you quality feedback instead of anger-filled ranting about the issue. Bottom line: solve the problem. So you slipped up, someone got upset and tweeted about it, you apologized publicly, contacted them in private and solved their problem. Awesome. Well done. Here’s the problem: you still have a customer who had a less than perfect experience with your company. Sure, solving their problem will most likely stop them from never shopping with you again and if you handled it properly, you may have even taken advantage of the opportunity and built a stronger bond with them. But how will you know? Just like every other aspect of your business; you need to be tracking your complaints and their results. Have a plan for how and when your team will follow up with affected customers. Reach out and ask if they’ve been back to see you. If they haven’t, find out why (it may or may not be due to the previous issue). Offer them a reason to come back. This could be a discount or a free upgrade, or just a current special you have. 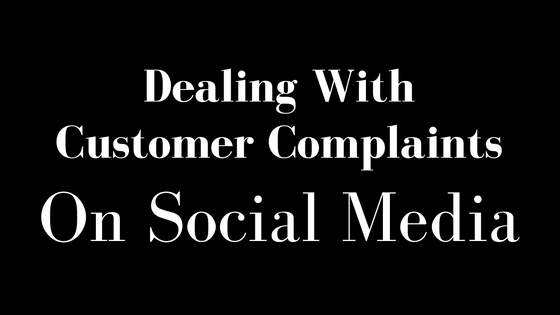 When it comes to customers complaining on social media, you have a limited time frame to put that fire out. Have a plan and make sure it works by tracking your efforts. Make sure your team understands how and why each step is taken. Most importantly, don’t view social media complaints as a negative thing. Social media can be an incredible source for feedback and when utilized properly, a great customer service tool.